Seven Layer Dip Recipe for Parties | Good. Food. Stories. I love seven layer dip. At least I thought I did. Until this summer, when I took a long, critical look at the classic, world-renowned tailgate and party staple and realized it had a fatal flaw. 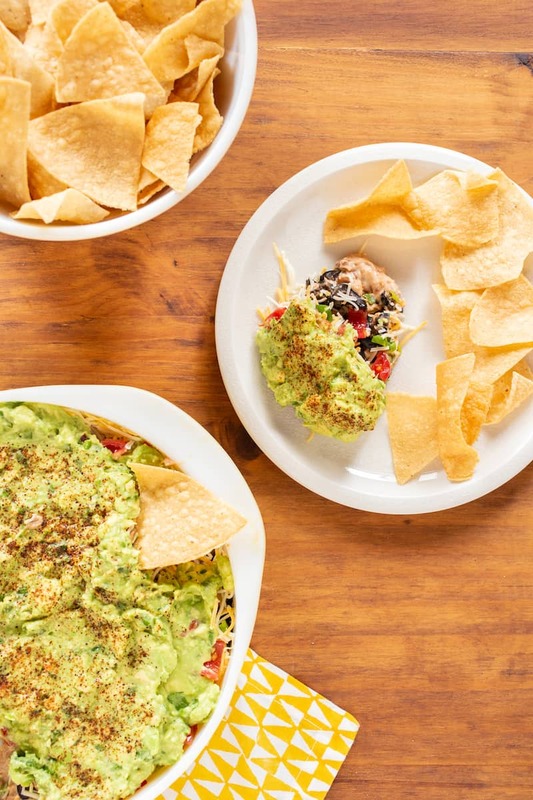 The problem lies with the way most of us have been taught to assemble the dip: the goopy stuff, like guacamole, is underneath all the stuff that inevitably falls off your chip because it doesn’t have enough “stick”—cheese, olives, etc. It doesn’t help that most of us use straight-up refried beans as the anchor layer. They’re usually way too thick to dig into without breaking the chip, which then sends the cheese flying across the room or back onto your plate. This faulty organizational method is slightly improved if you do the ladylike thing of politely spooning out dip onto an appetizer plate and then dipping from your own personal serving. But come on. Who does that? 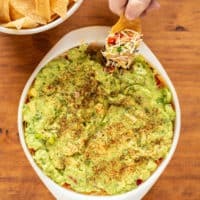 Everyone just digs their chip right into the communal bowl, not even looking at what’s happening because their eyes are glued to the TV screen, or wandering away from the tailgate buffet to grab another beer, or all the things we do at parties when we don’t feel like carrying tiny plates around. And that’s when seven layer dip chaos ensues. Being that I love to organize, I thought long and hard about finding a better way to get all the seven layer dip flavors properly onto my chip without such agita. Behold, my improved order of layering seven layer dip! Look at that glorious stacking! See, the beans are loosened up by sour cream, so they’re oh so scoopable. The black olives and scallions come next, where they become velcro-suctioned to the dippable beans. Next, the feathery shredded cheese, which usually flies everywhere because people throw it on top as the final layer. Not so here. A handful of chopped tomatoes weighs the cheese down, then gets sandwiched in by fresh guacamole with a power punch of citrus. Finally, a dusting of chili powder or taco seasoning makes the whole thing look less like a pile of glop. Because visuals are important here. Instead of one communal scooping trough, I like to divide the seven layer dip between a few smaller bowls so more people have easy access to the goodies. This also makes my husband, the inveterate black olive-hater, a happy man, since the dip can be made in two versions (I’ll take my seven layer dip chock full of black olives, thankyouverymuch). Oh, and there’s one more thing that will make seven layer dip even better. While it’s always best to use a thick chip to scoop your seven layer dip, why don’t you try using Doritos for a truly over-the-top dipping experience? This tip comes from my favorite Texan, who I’m sure wouldn’t give you the side-eye if you used Fritos as a dipping mechanism either. But trust. Whether or not you decide to go crazy with Doritos or Fritos, or keep it traditional with thick tortilla chips, try this new layering method for your seven layer dip. I promise you’ll be a convert. 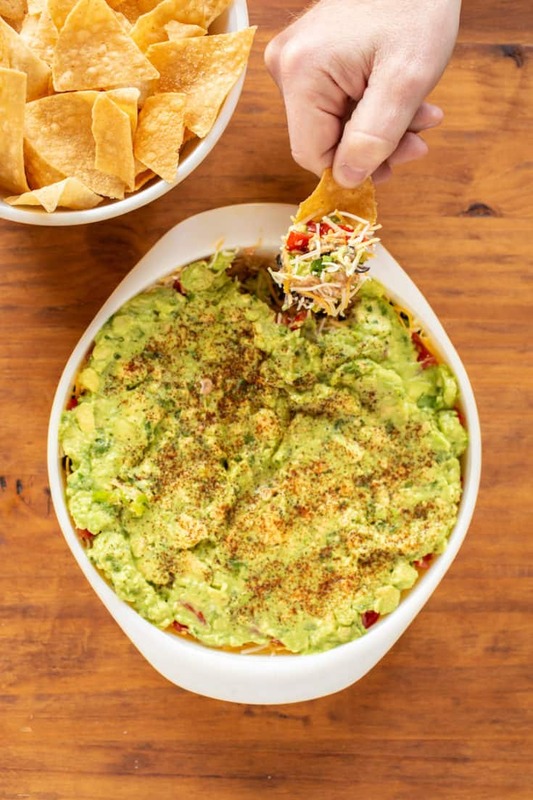 Seven layer dip is a favorite party and tailgate appetizer, but it could be improved a little. Here's a new way to layer it. Cut the avocados in half, remove the pits, and scoop the avocado flesh into a medium mixing bowl. Add the lime juice, salt, pepper, and diced jalapeno (if using). Mash gently with a potato masher or fork until the guacamole is to your desired creamy/chunky consistency. Mix the refried beans and sour cream together in a medium mixing bowl, then spread evenly in a serving dish or dishes. Sprinkle the black olives evenly across the creamy beans. Layer the scallions on top of the olives. Sprinkle the cheese evenly over the scallions. Sprinkle the tomatoes over the cheese. Gently spread the guacamole across the tomatoes to "seal" the dip in. As a finishing touch, sprinkle taco seasoning or chili powder lightly over the guacamole. Serve with tortilla chips, Doritos, or Fritos.